Every now and then I try a recipe and the result is so good that I need to immediately wrap it up in four layers and stick it in the back of the freezer, all in an attempt to not eat the entire pan while standing at my counter. Not that I would ever think of doing such a thing. Never. These bars are that good. 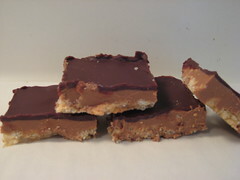 They have a candied crisped rice base (think Rice Krispie treats but flatter and denser) with a peanut butter/chocolate center, and are finished with a dark chocolate top layer. Yes, they are drool worthy. However, I did run into a few problems: The base ended up really hard in some places and really soft in others which I suspect was a result of me not working fast enough getting it into the pan, although I thought I was doing it rather quickly. This made cutting them difficult because it was difficult to get the knife through those parts. Any advice? The other issue I ran into was the chocolate began to melt a little as I cut them, which made for a really ugly cut. I think the next time I will use tempered chocolate for the top layer. In a large nonreactive metal bowl, combine the chocolate, corn syrup, and butter. Cut into 9 (Nine? They are nuts! You can easily get 18 from this) squares and serve. The bars can be stored in the refrigerator, covered tightly, for up to 4 days. These look great!! I love the idea of a crisped rice crust. Yum! What if you made the bottom layer more like a rice krispy treat? May be easier to cut that way. They look delish!! Rachel, it is SO good. Martwork, I thought about that, but the bottom layer is SO good! It seems you and I have the same “schtick”. Bake it, taste it – OMG it’s delicious – put it in the freezer fast before you eat it all. I can so see myself going crazy on this one. I love the taste of chocolate and pb together! This has got to be a great recipe. Thanks for posting!